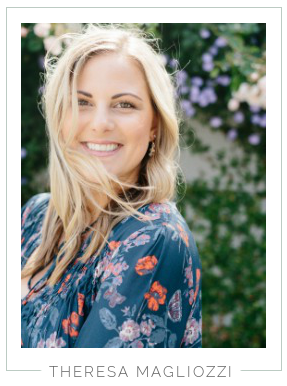 Since there was a period this summer that I wasn't blogging frequently, there are still a few fun things I haven't shared with you! So for the next few weeks I thought it would be fun to do Flashback Friday and share those pictures and stories. In July, one of Andrew's best friends from High School got married in Berkeley. Of course this meant it was a mini high school reunion because Andrew's other best friends also flew in to celebrate. We had quite the crowd at our house for a portion of the weekend. I loved it! I was especially excited to meet Dan and his wife Mary-Cris. Dan is Andrew's closest friend and I had yet to meet him because he's in the Air Force and they live out of state. Mary-Cris and I hit it off immediately, I'm already looking forward to seeing them again! Maryann also flew out, who I got to know pretty well when Andrew still lived in San Diego. She now lives in New York City, so I think plan a trip to visit her ASAP! After the wedding festivities were over; Dan, Mary-Cris and Maryann stayed with us in the city for a few extra days. Andrew and I decided to take Monday off so we could play tourist in the city with them. 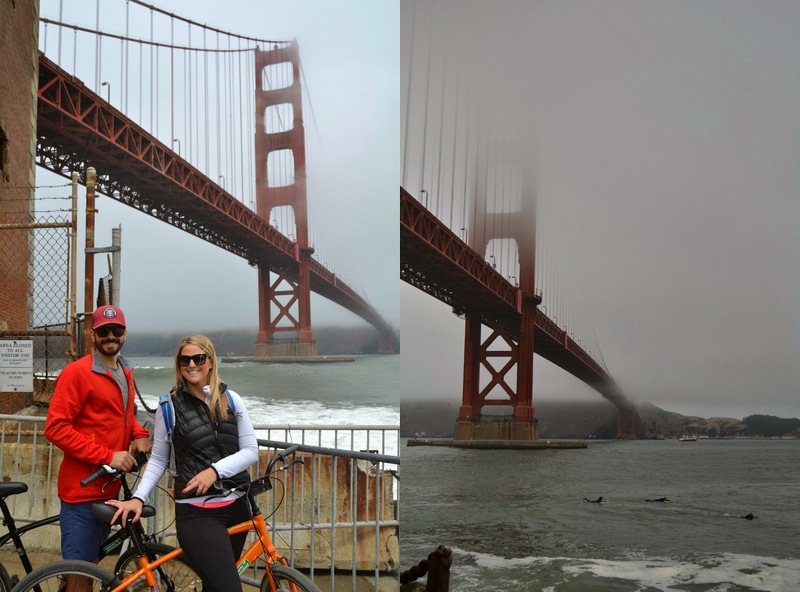 I was really excited because they wanted to bike across the Golden Gate, which I had always wanted to do! After breakfast, we went down to Crissy Field and rented bikes from Sports Basement. That is my local tip for you, instead of renting from the big name places near Pier 39 that advertise in hotels, go to Sports Basement! Our bikes were great and only $15, plus it's a lot closer to the bridge, with free parking and great bike paths in the area. We took our time riding to the bridge, stopping to take photos along the way. And surprisingly, when I waved down two runners to ask them to take a photo for us, it happened to be a girl Andrew and I knew from college who was visiting from San Diego! What are the odds?! 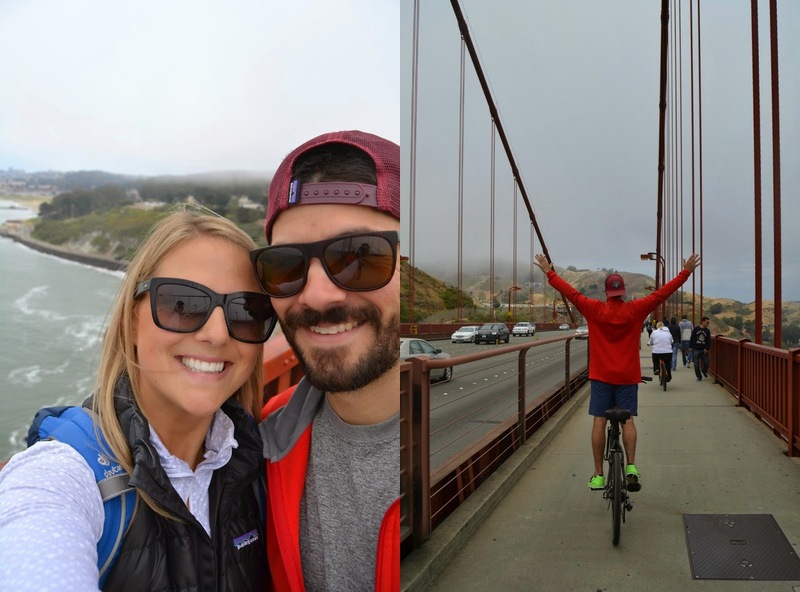 We stopped again at the base of the bridge so Andrew and Dan could watch some locals surfing under the bridge at Fort Point, and reminisce about their days surfing in high school. Since it was Monday, the bridge wasn't too crowded but we did have to ride on the right side with pedestrians. The left side is only open for bikes on the weekend. 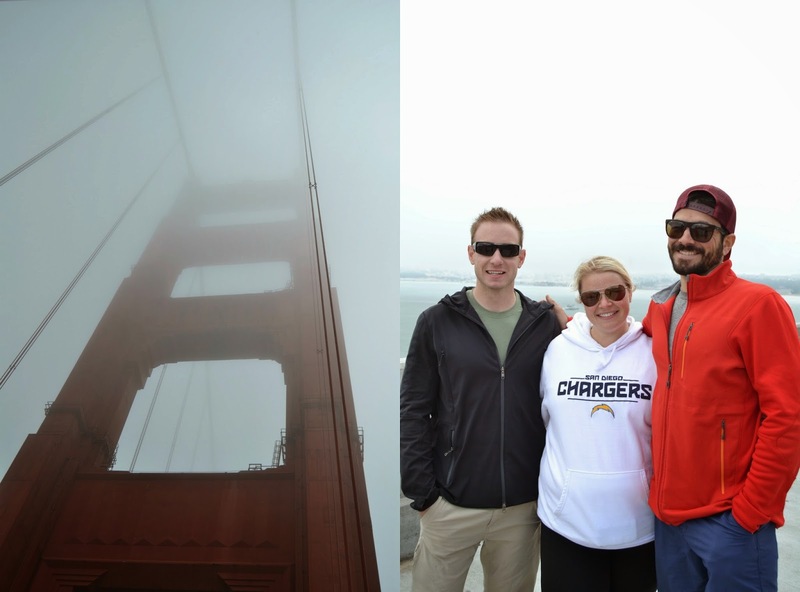 It was a typical San Francisco summer day, and the fog obstructed most of our views. But it was still fun riding together and stopping for photos. Plus, I suppose they got the true San Francisco experience that way. Hopefully they'll come back to visit us in the fall so they can enjoy our amazing Indian summers and great city views. I loved having an excuse to play tourist in our own city! The next thing on my San Francisco Bucket List is going to Alcatraz. Andrew has never been and I was only about 10 when I visited, so I think we're due for a trip. I might look into the night tours, what do you think? Next week I'll be back with more about the wedding! I've been to a lot of weddings, and this one is really close to topping the list for the fun/party factor! Would anyone be interested in linking up for Flashback Friday posts if I created a link up? You could link anything you wanted: favorite old posts, or share about a story or event from the past. Maybe something from before you started blogging or that you just haven't had a chance to post yet. Let me know if you're interested, It would be sad to create a link up and have no one participate. Can we do this when I come to visit?? This looks like so much fun!! And how the HECK are you so tan??? I'm jealous!! Flash back Friday's sounds like a cool idea. I would love to go to Alcatraz at night! Though I've never been in the day either. Your pictures are so pretty! I love the fog. It always amazes me how thick and fast it can come it. I LOVE your pictures of the Golden Gate, so pretty! My fiancé and I biked it over the summer as well and it was just as foggy (surprise surprise) not only was it foggy but extremely windy, the hat I was wearing almost blew away!